Watch Khan Academy videos by topic. Follow along with captions. Log in to your Khan Academy account and earn energy points for the videos you watch. Planning a long trip? Download any video and watch it later offline. 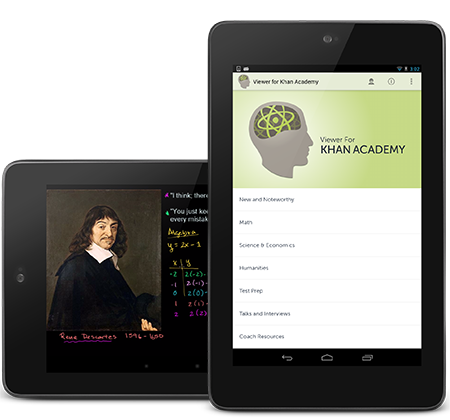 "We're excited that Concentric Sky has graciously created an unofficial Android version of the Khan Academy iPad app." Viewer for Khan Academy is a product of Concentric Sky. Viewer for Khan Academy was developed in the Silicon Shire. Help contribute to the project. Fork the codebase on GitHub. © 2014 Concentric Sky Inc. Android & Google Play are trademarks of Google Inc. Suggestions? Bugs? Send us an email.